It's finally time for our famous Arbor Nights Summer Concert! Join us as we slip into the weekend with Live Music, Food truck, Lubbock Grown Wine, and a gorgeous West Texas Sunset! *Wine $7 a glass, or buy the bottle! Live Jazz/Blues by Lubbock's own The Standard Trio! Bring a lawn chair if you have one to guarantee you have a seat! We're just as excited about TTU Basketball as you are! We'll have the game on starting at 5pm! Hors d'oeuvres start at 3pm! Game Watch Party starts at 5pm. If you'd like to pick up early (we open at 1pm), or would rather wait until Sunday or some other time, that's totally fine too! We mean it when we say we're dog friendly! #Throwback to that time Samson came out for wine tastings and stole the show. 101 Best Wineries in United States! We don't mean to brag, but we were recently listed as one of the 101 Best Wineries in America by The Daily Meal! And what a list it is! We're #74! All grown right here in Lubbock! Join us for our first ever Arbor Night at Pheasant Ridge Winery! Live music by Physicist Dr. Ra Inta and wife Beth. They'll play guitar and sing as we serve wine by the glass and watch a beautiful Texas sunset! Spend an afternoon with Dr. Ra Inta, a Physicist who designed and built guitars for his Doctoral work. We’ll discuss the physics of sound and how the guitar makes sound, complete with songs on a guitar he made. Check your fear of Physics at the door! Dr. Inta currently studies the vibrations of (and traveling through) space-time, known as gravitational waves, at Texas Tech University. His previous research includes vibratory communication in termites and standing electron waves in quantum devices. Pheasant Ridge Winery was awarded Gold at the 2017 TEXSOM International Wine Awards. There were over 3,500 wines from 29 countries entered into competition. Wines were judged blindly by 71 wine professionals from around the world. This year was the largest competition ever. Only nine Texas wines won a Gold Medal, including our own 2015 Old Vine Dry Chenin Blanc. This wine holds a special place in our hearts, as it is the first wine Bobby and Jennifer Cox have released since buying the winery back. We're honored to have received this award, and hope it's only the first of many we bring back to the Texas High Plains region! To everyone that braved the mud and rain for tastings today, we just wanted to take a second to thank you! We're blessed to have the customers we do, and will continue to do our best to earn your business. Texas Wine Journal Tasting Director Daniel Gelada, after tasting our 2006 Chenin Blanc, asked "why don’t we see more of these great wines being produced today in the modern, burgeoning Texas wine industry?" We can't speak for the industry, but we're happy to speak for ourselves. We've cared for some of our Chenin Blanc vines for over 37 years. They have produced, and continue to produce, exquisite Texas wine. 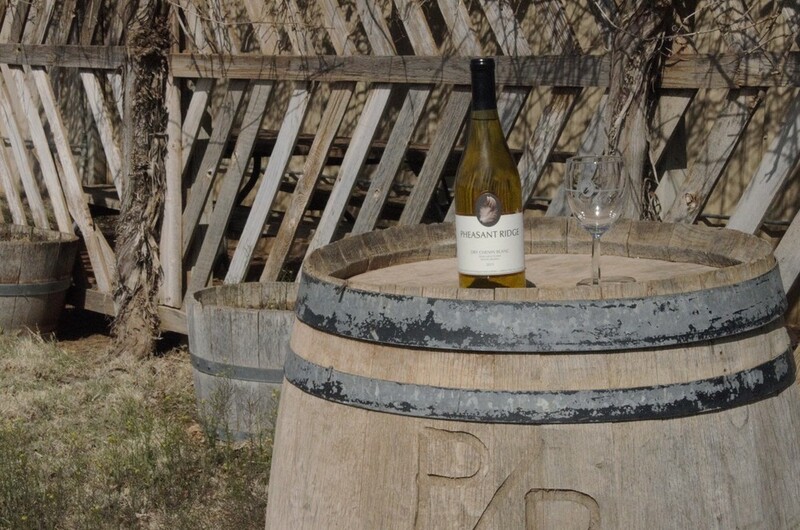 Our 2011 Dry Chenin Blanc is an excellent example of how Texas can do Chenin Blanc right. We invite you to give it a try! Remember we ship wines for free within the state of Texas! We were thrilled to be featured in this write up by Daniel Kelada, Tasting Director of the Texas Wine Journal! Thank you for visiting us Daniel, it was truly a pleasure showing you around the winery and talking great Texas wine! Pheasant Ridge fan Michael Clark just sent us a photo proving he's been going to the right sort of wine parties! What's your favorite Pheasant Ridge wine?